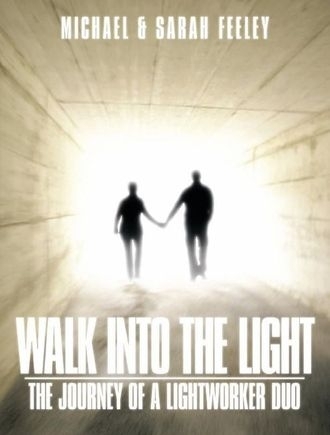 Walk Into The Light - The Journey Of A Lightworker Duo is the real life story of two former police officers who through some synchronastic circumstances found each other, and began what would turn out to be a life altering spiritual journey for both of them. Their journey to date is chronicled in this book, which they co-authored. I wasn't exactly sure what to expect when I was first asked to offer a review of this book. The title itself is rather enigmatic unless you are familiar with the term "lightworkers" and to be honest being more of a nuts and bolts type of psychical researcher than a spiritual one I was not. However, I was sufficiently intrigued, and looked forward to learning more. The book opens with an introduction to the authors, and the purpose of their book, which is as much to teach or pass on what they have learned thus far in their own spiritual quest as it is to document their experiences. Chapter one serves to set the tone for what is to follow as we begin to learn more about the circumstances that led them to where they are today, and their connection to a Victorian teenager by the name of Sarah Jenson. There are several chapters on varied paranormal topics such as out-of-body experiences, ghosts, and hauntings, spirit possessions, UFO visitations, and angels. Of particular interest to me was their thoughts on UFOs and UFO experiences as this is a subject not normally covered in more spiritually oriented books. I was fascinated and pleasantly surprised to learn that they had a sighting on December 1st 2008 that was very similar to one that I had back in early November 1990. Due to the wide range of experiences talked about in this book I think that many readers will find at least one thing if not more that they can personally relate to, much as I did with the pulsating UFO orb. There is a warmth and sincerity to be found in Sarah, and Michael's writing style that makes their book an enjoyable read in my opinion, even if you personally differ in some of your own views. There are also numerous drawings, sketches, and photos added, which serve to enhance the reader's experience. I would definitely recommend this book to those interested in these topics, and I wish the authors all the best in their continued journey.